Above: ‘Yellow Vest’ protesters stage their 19th round of protests in Nice, France. Photo Reuters. French “yellow vest” demonstrators began their 19th consecutive weekend of protests against President Emmanuel Macron’s government Saturday as military units were deployed to assist police. Police and demonstrators clashed sporadically in Paris and other French cities Saturday as “yellow vest” protests against President Emmanuel Macron’s government took place. 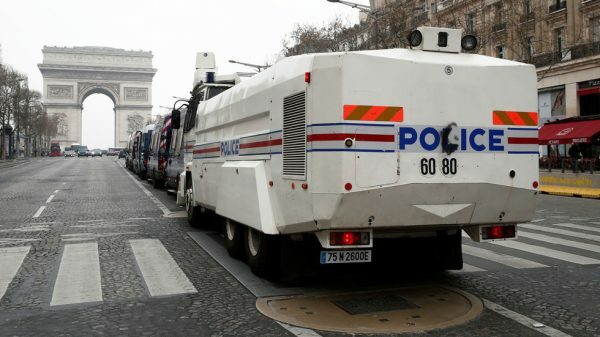 ellow Vest protests blocked by a police convoy at the Champs-Elysees avenue in Paris, France on March 23, 2019. By Benoit Tessier for Reuters. 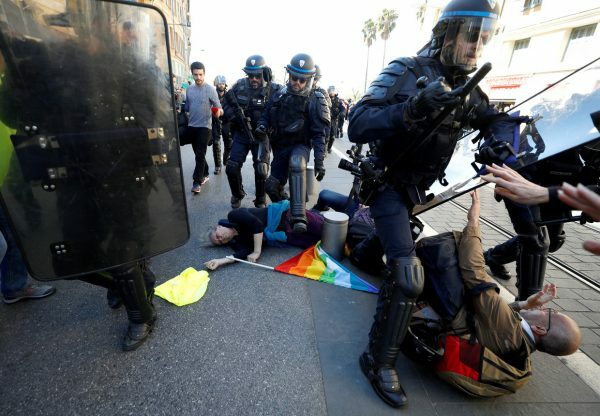 One of the protesters said he was determined to demonstrate every Saturday as long as President Emmanuel Macron is in office – as of now, that’s 163 Saturdays to go, he calculated.